Performers include: John Ritter, Joyce DeWitt, Richard Kline, Don Knotts, Suzanne Somers, Priscilla Barnes, Audra Lindley, and Norman Fell. Two friends and roommates, pragmatic Janet Wood (Joyce DeWitt) and ditzy Chrissy Snow (Suzanne Somers), are in need of a new roommate. The morning after their goodbye party for their former roommate, they discover leftover guest Jack Tripper (John Ritter) passed out in the bathtub. Jack, who is training to be a chef, is living at the YMCA, and both Janet and Chrissy convince him to move in. Landlord Stanley Roeper (Norman Fell) takes more convincing, however, and only agrees to the arrangement when Janet lies and tells him that Jack is gay. Once Jack moves in, comedy antics ensue. Though he’s a ladies-man, Jack must pretend to be gay often as both Mr. Roeper and his sexually-frustrated wife Helen (Audra Landry) live downstairs and frequently pop in on their renters. Later in the series (when the Roepers were given their own spin-off), foolish Ralph Furley (Don Knotts) becomes the trio’s new landlord. Chrissy moves away and is replaced by her cousin, Cindy Snow (Jenilee Harrison), and then nurse Teri Alden (Priscilla Barnes). Though this slapstick bedroom comedy saw many cast changes during its run, the show never failed to make audiences laugh. 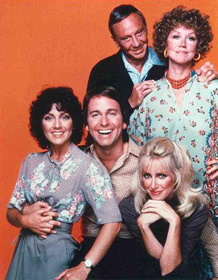 Three’sCompany is the one and only comedy show that I can watch at any time and laugh. Oh sure, there are many other funny shows I like, but this is the only one where any rerun will crack me up. I watched all 174 episodes when they were originally airing, as well as their reruns since. It’s innocent, not vulgar. My ultime favorite show! I watch reruns all the time, over and over again, and still can not stop laughing!!! Rest in peace: Audra Lindley, Norman Fell, Don Knotts, and John Ritter. This has been one of my favs since I was very young! I have episodes on my dvr and when I’m feeling down I turn one on and I’m instantly cheered up. It’s very comforting for me.